Sandy Kenyon reports on "The Fix" producer Marcia Clark. NEW YORK (WABC) -- It's been almost a quarter century since the "Trial of the Century" began, and Marcia Clark has gone from prosecutor to producer with stops to write crime novels along the way. Now, she's taken all this experience and put it all into a new TV series. To watch "The Fix" is to hear echoes of the O.J. Simpson case - which is only natural given that Clark -- the prosecutor who tried and failed to put Simpson behind bars -- is one of the creators. "I love the ability to make things up," she said. "It's really fun, and I get to control the outcome. Even better." "The Fix," which is set in the present day, recalls the challenges Clark faced during her famous trial. "Marcia wrote what she knew and sort of fictionalized it and took off from there," said Robin Tunney, who plays the prosecutor in the series. "We're not letting reality get in the way of good drama. It's a fantasy, but there are little nuances nobody would know but Marcia. Nobody could've written that but Marcia." The man on trial this time is a movie star who was cleared of murder eight years ago and now faces another charge of homicide. He is played by Adewale Akinnuoye-Agbaje. "One of the things that's really exciting about it is we really do get the nuts and bolts," he said. "I mean, you will, as a viewer, be saying, 'Really? Does that really happen in the prosecution? Do they really do that?' And vice versa for the defense." Akinnuoye-Agbaje has two law degrees from the University of London and Kings College, so does this ring true for him? Or is it Hollywood-ized?" "Well, that was one of the things that intrigued me about it," he said. "The legal background, and knowing Marcia is an expert in her field." It's something that isn't lost on his co-star. "Just really impressed that he has a fallback career, because if this acting doesn't work out for me, I'm broke and on the street," Tunney said. "A law degree? I barely finished high school." Acting is working out just fine for Tunney, but while we're on the subject of high school, Marcia Clark graduated from Susan E. Wagner High School in the Manor Heights section of Staten Island. She has fond memories of hanging out in Manhattan as a teen, though she relocated to UCLA for college. 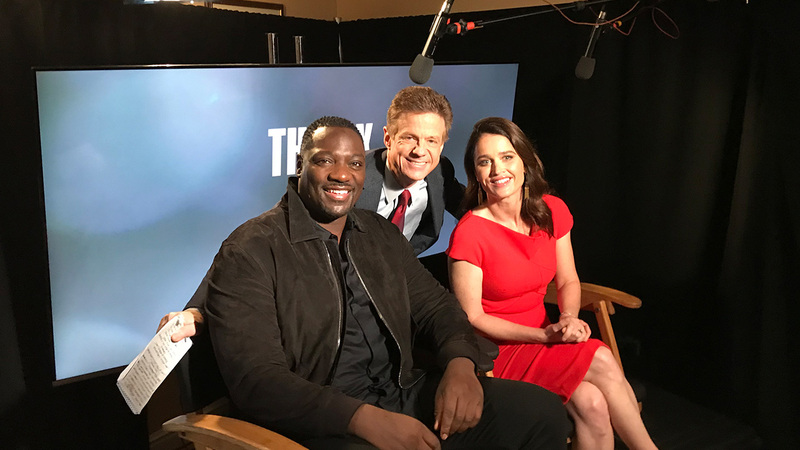 "The Fix" airs Monday evenings at 10 p.m. on Channel 7.